It didn’t snow in June, which was a good thing. 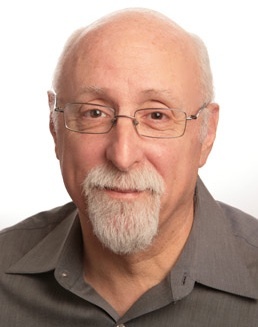 The Pi hosted Walt Mossberg, the personal technology columnist for The Wall Street Journal. Mossberg had been scheduled to speak at the February General Meeting, but the weather forecast was decidedly grim. June, on the other hand, was warm and friendly. Mossberg’s presentation was eagerly awaited, and drew a large crowd. But you’ll have to read about everything else we did first. As usual, there were many interesting questions, sparking multiple discussions, some simultaneously. One of the first questions concerned a CD-ROM stuck in a drive. Should the computer be sent in for repair? The answer was: “Maybe.” But before taking the trouble to visit your local Apple Store and Genius Bar, try something first. Hold down the mouse button and restart the Mac, and continue holding down the mouse button until either the CD-ROM pops out or the Mac fully boots. Since the release of the original Macintosh, holding down the mouse button at startup (or reboot) will eject any removable media, be that a 3.5” diskette or a CD-ROM or DVD. If the removable media does not eject, you may need technical assistance. As an added note: never, ever put a CD or DVD with a paper label into a slot-loading drive. The labels tend to come off inside, necessitating a costly repair. What is the best way to run Windows on a Mac, with Boot Camp or Parallels Desktop for Mac or VMWare Fusion? This isn’t a simple question, but the options can be summarized as: all three require an Intel-based Macintosh, and all three require a licensed copy of Windows XP or some version of Windows Vista. Boot Camp requires that you boot your Mac directly into Windows; when running Boot Camp, you have no access to Mac functions or capabilities. Parallels Desktop for Mac and VMWare Fusion both allow Windows to run within Mac OS X as “just another application.” You can work side by side with Mac applications and Windows applications, and even exchange data between the two. Ideally, you should have at least 1.5 to 2 GB of RAM to use Parallels or Fusion, plus lots of disk space. As a bonus, Parallels and Fusion allow you to make copies of the Windows virtual disk, so that if you corrupt Windows in some way (not all that uncommon), you can simply throw that image in the trash and use another. You can’t do that with Boot Camp. If you are testing a drive, which is more effective, writing zeros to the disk once, or seven times, or 35 times? If you are just testing the drives, writing zeros to every byte is a great test. If you are erasing data, various parts of the US government require overwriting everything seven or 35 times, depending on the level of sensitivity of the data and the paranoia of the agency. Keep in mind that writing to every byte on a large disk takes a long time; doing this multiple times (as Disk Utility allows) will take longer. If you have the patience, go for it. Can you use an older Airport Extreme to extend the wireless network of a newly purchased Time Capsule? Absolutely. Set up the Airport Extreme to “bridge” to the new Time Capsule, and it should effectively extend the range of the wireless network. Do note, however, that while a Time Capsule supports the very fast 802.11n protocol, older versions of the AirPort Extreme may be limited to the considerably slower 802.11g protocol, and any device connecting to the slower router will have a slower connection. An Apple Genius moved all my files from my old PC over to my new Mac, but now some of the old files are “locked;” how do I throw them away? Put the entire directory of files you want to erase into the trash, then – while holding down the Option key – select Empty Trash from the Finder menu. How do I get my Internet and Airport base station working after I have been gone from home for a while? This could be complicated, since a Digital Subscriber Line (DSL) uses different technology from a cable modem, which in turn uses different technology from Verizon’s FiOS (Fiber Optic) service. But generally speaking, first turn on the router or cable modem or other box you got from your Internet Service Provider (ISP), make sure it is getting a signal (look at the blinky lights), and then turn on your AirPort base station. You may have to call your ISP directly if their network has “forgotten” how to connect to your equipment. Following the Q&A session, Bob Jarecke took the stage to go over some recent organizational changes. He first announced the results of the May Pi election and, with a hint of resignation, announced that the new Board had -- again -- elected him President. He mentioned that the Board still had two vacancies, and was actively looking for volunteers to fill them. And if all goes as planned, the membership will have a chance to vote on some organizational changes at the July General Meeting. Kitty’s Koffee Klatch, the officially unofficial name for the morning coffee break, followed Bob’s announcements. Many in the audience took the opportunity to continue the Q&A session, while others ravaged the coffee and donuts. As Walt Mossberg’s Wall Street Journal columns and blogs are widely read, the Pi had visitors from the Richmond Mac User Group, the Virginia Mac User Group, the National Capital Apple Mac User Group, and the Capital PC User Group, making the coffee break both louder and more interesting than usual. People came from West Virginia, Lynchburg, VA, Pennsylvania and Delaware,, as well as from Washington, DC and Maryland. Following the break, Bob valiantly tried to rein in the chattering masses, thanked the visitors from far-flung lands, and introduced our key presenter, The Wall Street Journal columnist, Walt Mossberg. Speaking very casually and without notes, Walt Mossberg immediately grabbed, and held, the attention of the audience. He spoke for about 40 minutes on personal technology, and while Macs and iPods and iPhones were featured prominently, his presentation was more generally focused on how we use personal technology in the 21st century, what we’ve managed to accomplish, and what still remains to be done. One of the first things Mossberg said was that this was not his first Washington Apple Pi meeting. Many years ago, after watching the initial round of personal computer introductions from the sidelines, he decided to spend around $3,000 and bought an Apple IIe. His next task was convincing his spouse that this was a wise investment rather than an expensive toy. He joined Washington Apple Pi to learn how to do useful things with the Apple IIe, and eventually managed to turn his hobby into his present job. A couple of decades later, he thinks his spouse has finally forgiven him -- a good thing, as their home now has at least seven computers. The Apple IIe, alas, has long since moved on. Mossberg noted that, in the early days, the personal computer was the center of its own universe. You could use a modem to reach out to a bulletin board (BBS) and exchange information, but most of the time the computer and its user were not connected to anything else. Today, a new generation of devices such as the iPhone and the iPod touch are designed to be connected to the Internet, episodically or all the time. Many users have their personal computers on the Internet constantly, so that the computer has become essentially a peripheral of the Internet, and derives much of its purpose and value from the connection. While the original iPhone (the meeting was held two weeks before the iPhone 3G went on sale) has been a success, Mossberg pointed out that only a few people seem to realize what it really is: a small computer, with a computer operating system, that fits in your pocket. And yes, it can make phone calls. The new iPhone 3G should make this capability far more obvious, not because of the cell phone features but because of the faster Internet connectivity and a host of new applications designed to take advantage of the device as a computer. Though not as widely touted, the iPod touch, too, is essentially a shirt-pocket computer that can also play music and video, and the forthcoming iTunes Apps Store should greatly expand on this capability. At several points, Mossberg stopped to reemphasize his focus on personal technology. His column and blogs do not concern themselves with Apple as a corporation or with its stock value, or with corporate enterprise computing. Corporations are interested in making profits, and enterprise computing is aimed, in many cases, at maintaining control. Personal technology, on the other hand, should be focused on the user, and extending the user’s capabilities. From this perspective, he felt it was a mistake for Palm to divorce itself from the Palm OS. Just as Palm was entering the mobile phone market, it did so without control of a good, modern operating system, and it hasn’t thrived. Microsoft took a different route with its Windows Mobile operating system. This OS has nothing to do with Windows, though, aside from using the name to show corporate affiliation, and Windows Mobile devices have struggled to integrate with Windows personal computers, despite the presumptive compatibility. The iPhone, on the other hand, by taking a modern operating system, Mac OS X, and adapting it to a mobile platform, created something that “just works.” The iPhone has more capability than most of its owners realize, yet that power does not come at the expense of complexity. After Mossberg's opening presentation of roughly 40 minutes, he opened the floor to questions. Unlike most Pi guests, Mossberg does not pretend to be a computer expert, so the Pi event planners weren’t entirely sure what kinds of questions would be asked. Would the audience try to turn it into a technical Q&A session? Would they ask about The Wall Street Journal’s recent purchase by Rupert Murdoch? The Pi’s event planners didn’t know what to expect. What they got: one of the liveliest question and answer sessions in years. Mossberg deftly channeled the questions toward his area of expertise: writing about personal technology. When someone asked about Steve Job’s health, Mossberg replied that, while he has met Jobs on a number of occasions, health questions are a personal matter, and he’s never been so rude as to make inquiries. When someone tried to tie Jobs’ health to Apple stock prices, Mossberg responded by saying, again, that health was a personal matter, and his column didn’t cover any company’s stock prices, much less Apple’s. He did add that, when he saw Jobs at the June Developer’s Conference, Jobs looked fine. Mossberg pointed out, more than once, that he does not own stock in computer companies, and that all the technology that he reviews and writes about was purchased using his own funds. (His Web site, Personal Technology, has an extensive ethics statement.) He does not write about technology companies as a business, or about investments or finances. Instead, he writes about personal technology and how technology issues affect consumers. Because of his consumer focus, his comments about Apple, in particular, have not always been positive. He recommended that consumers stay away from Apple products in the late 1990s, which he considered a “dark” period. When one member asked if Mossberg thought AppleCare was “the single most important acquisition after purchasing a new Mac,” Mossberg disagreed with the premise. He pointed out that, while he’s had a great many Macs over the years, only one of them ever gave him sufficient trouble that he had to use AppleCare. Strictly from a consumer point of view, Mossberg didn’t think AppleCare should be considered a necessity. When someone asked if Mossberg knew of any Apple plans for a “headless” Mac, along the lines of the late Mac Cube, Mossberg said that he was privy to no Apple secrets. But he dismissed the need, disagreeing with the questioner’s premise that the Mac mini lacked the power to do “serious” work. In Mossberg’s view, the Mac mini is very much a serious machine, and if you really want a “headless” Mac (i.e., a Mac without a built-in monitor), the Intel-based Mac mini can probably do anything you might want. Mossberg also had praise for Amazon’s Kindle. He has tried, at one time or another, all the portable electronic “book” readers, and the Kindle comes closest to being a genuine book replacement. Amazon uses a clever, unobtrusive wireless system to deliver books, newspapers and blogs to the Kindle, without any particular effort on the part of the user. The Kindle’s storage capacity is more than adequate for most people, and the battery is robust enough to make the Kindle a suitable companion on a long plane flight. But the Kindle does have weaknesses, most notably the inability to make annotations or highlight items as you can with a “real” book. The audience seemed like it would have happily continued asking Mossberg questions until he collapsed from hunger or thirst. Fortunately, Bob Jarecke rescued him after about 90 minutes; he thanked Mossberg for coming, and offered him an honorary membership in the Pi. As the June meeting was also the Pi’s 30th Anniversary celebration, the audience turned its attention to birthday cake and Papa John’s pizza. Bob Jarecke had looked up the address of the nearest Papa John’s on the Web and, since Bob’s laptop was plugged into a projector, the audience got to watch. Mossberg noted that this was a first, for him; while he’d heard vague stories about ordering pizza with a computer, this was the first time he’d actually seen it done, and for 120 people, too. Before making the pizza disappear, the audience sang “Happy Birthday” to the Pi, which sounded better than expected. In addition to pizza, there were two large anniversary cakes, which vanished quite rapidly. During the refreshments, Mossberg was mobbed, as was Dana Schwartz, one of the first 50 Pi members. The General Meeting adjourned at that point, and people divided up to attend the Special Interest Group (SIG) breakout meetings. The iLife SIG remained in the large multipurpose room; the Beginners SIG and new Genealogy SIG convened in two adjoining classrooms. It was a grand event. From start to finish, everything ran smoothly, with lots of time for informal social interaction and enlightenment. Walt Mossberg proved to be as polished a speaker as he is a writer. If you missed the meeting, or want to hear more from Mossberg, check out his Web site, http://walt.allthingsd.com/, or read his columns in The Wall Street Journal. After a weather cancellation of the February meeting when Mr. Mossberg was to speak, we have rescheduled. We have a tentative "yes" from the noted Wall Street Journal technology columnist so keep your fingers crossed! This meeting will also be our 30th Anniversary gala. The Pi has endured for three decades and we think that is a fine accomplishment, so break out the party hats and kazoos and celebrate in fine style. We will have plenty of refreshments, eats and cake for everyone. And, when the noise has died down, we will adjourn to separate rooms and continue with the SIG sessions. This meeting should be a memorable and fun event. 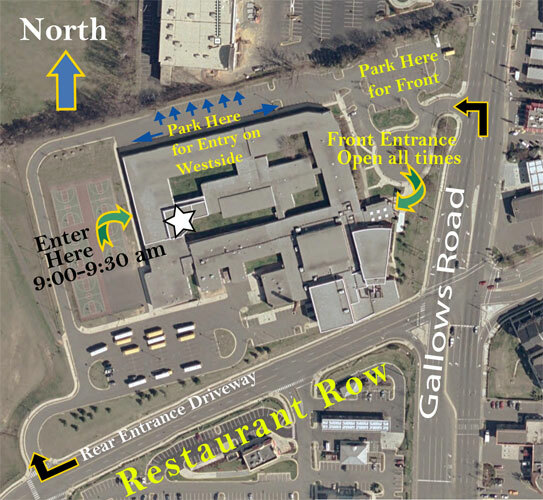 In June we return to our regular time and location, with the Question and Answer session starting at 9:30 a.m. at Luther Jackson Middle School, 3020 Gallows Road, Falls Church, VA.
By public transport: take Metro to the Dunn-Loring station. The school is on the same side of Gallows Road as Metro, and is about a 20 minute walk from the station. If you prefer to take a bus, the 401 Fairfax Connector leaves the station at 9:18 a.m.